The "teenpack" is looking for adventure when they discover a mysterious old lighthouse and the even more mysterious keeper, Rafael. Through the lighthouse, the young teens are transported to Bible times where they interact with timeless characters and learn of a loving God who cares for His people throughout all the ages. These action-packed, top quality dramas are geared to youth ages 10-15, but are great for the whole family or for classroom use. Creative, easy-to-use PDF study materials are included to help young teens apply the faith-building lessons to their lives. 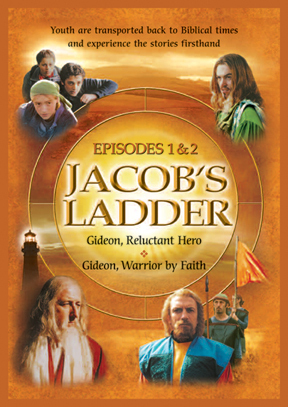 Episode 1: Gideon, Reluctant Hero The Hebrew people have forgotten about the mighty God of their forefathers. They are being lulled into idol worship by the Midianite conquerors. God calls the young man Gideon to stand up to these oppressors and their false gods. This story will challenge you to lay aside your idols and worship the one true God. Episode 2: Gideon, Warrior by Faith An angel has told Gideon he will free God's people from the Midianites. But, with no army and facing outrageous odds, Gideon finds it hard to believe and even harder to act on faith. Watch as God gives Gideon just what he needs to strengthen his faith. In the process, Gideon learns to depend on God to do the impossible.